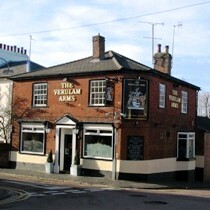 The Verulam Arms in St Albans is a smart pub around 5 minutes walk from city centre. Recently refurbished and now more of a bistro pub serving quality food at lunchtimes and evening until 9:30pm, except Mondays. Four regularly changing real ales are available and at the time of the review these included Black Sheep and Youngs bitter. The Verulam Arms is owned by the same people that own The Boot which tends to explain the great choice of real ales. Most drinkers and diners appeared to be rather middle-class and in their late twenties through to early forties. This place seems to have a pleasant atmosphere. Glancing at the menu shows that it doesn't do any typical pub grub but does more upmarket 'fancy' meals. Home-made pie night on Monday evenings - pie and pint £7.95. An application has been received to turn the pub into a block of flats - very sad. Re-opens as a pub. Mainly setup as a bistro to serve evening meals rather than beer. A company called The Foragers appear to manage the pub.